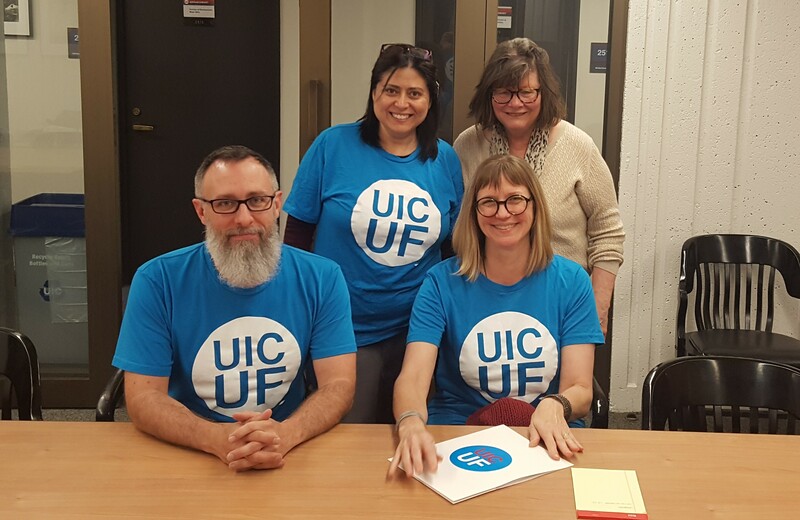 UIC United Faculty | Join Our Union! UIC United Faculty is an organization run by and for faculty members at the University of Illinois at Chicago. The more members get involved, the more effective our union will be. We strongly encourage every eligible faculty member at UIC to join our union! You are eligible to join if you are full-time (51%+ appointment) tenure track faculty or full-time non-tenure track faculty who has either a terminal degree in your field, or four (4) consecutive semesters teaching, not including summer semesters, at UIC. Dues are 1% of a member’s base pay. If you earn under $50,000 per year, dues are reduced to 0.5%. OR scanning and emailing it to us directly at UICUnitedfaculty@gmail.com. A UIC United Faculty representative will confirm receipt of your completed application as soon as possible. It may take up to two (2) pay cycles for dues deduction to begin.